Provide comfort for the family of Nancy Racine with a meaningful gesture of sympathy. 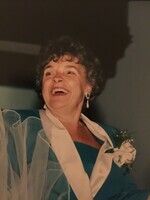 Nancy Caroline Racine passed away with her family by her side, on January 20, 2019 at Hartford Hospital. She was the wife of Robert Racine. Nan was born in Sharon, CT on Nov. 3, 1939 to the late George and Mildred (Ostrander) Webb and was a longtime Salisbury resident. She had battled health issues for a long time but never complained or let them stop her from enjoying her life. Nan was very proud of her Native Indian Heritage. The family roots are connected to the American History of Mount Riga in Salisbury and its role in the American Revolution. Nan was dearly loved by all who knew her. Everyone was welcomed at her table for coffee where Nan spent many days reminiscing and enjoying her company. Her greatest joy was spending time with her family but she also loved to shop for bargains, travel, especially to Las Vegas to visit family, beaches and taking care of her many house plants. She also loved to decorate her home for the Holidays and enjoyed many morning coffees with the back yard sun shining on her face. In addition to her husband Robert, Nan is survived by two daughters, Brenda Robinson and Jodi Dennison Belmonte, three sons, Stacy and Troy Dennison and Gregory Webb, a grandson, Patrick Morris and wife Tiffany, a granddaughter, Julia Belmonte, two great-granddaughters, Kaylie and Lanaya Morris, two brothers, Roland and Wesley Webb, a sister Shirley and a step daughter Theresa Racine. Nan was predeceased by a grandson, Carl Morris, two brothers, George and Rodney Webb, a step son David Racine and two sons-in-law, Leonard Belmonte, III and Dennis Robinson. A memorial service will be held at the Salisbury Congregational Church, UCC on Tuesday, January 29, 2019 at 11:00am. Burial will be private in Salisbury Cemetery. To send flowers in memory of Nancy Caroline Racine, please visit our Heartfelt Sympathies Store. Provide comfort for the family of Nancy Caroline Racine by sending flowers. Heartfelt Sympathies Store purchased flowers for the family of Nancy Racine.